Well that is it for the day. It comes down to this for Mali and Guinea. Good luck sleeping tonight if you support either of those sides. Thank you for all your interaction today and throughout this tournament so far. The BBC Sport website will keep you up to date on plans for the drawing of lots as we get greater clarity on when it will happen tomorrow. Afcon action then returns on Saturday as the quarter-finals get underway and there will be a live text covering it all right here. In all, 10 of the 24 matches at Afcon 2015 have now ended 1-1. Andrew Priestley: A nation's progression to the knockout stages of an international competition will be decided by the drawing of lots. Surreal. Festus Abrah-Yeboah: We have seen too little goals in this tournament over all. Is it really done to attacking flaws or stand-out defending? What can you say about this? What a group. Pre-tournament favourites Ivory Coast are in the last eight and will meet Algeria in a clash of two huge African nations. That's the simple part though as tomorrow we will know if Guinea or Mali are in the quarter-finals when lots are drawn. Imagine the nerves...all your preparation comes down to luck of the draw. Ivory Coast are through. Cameroon are going home. Lots will be drawn. You heard it here first...lots will be drawn. Free-kick Mali...yes another one...Abdou Traore slams it to the box and out comes Naby Yattara to punch. You can feel the nerves emanating from these players. I'd say next goal wins rather than splitting by drawing lots but we may be here all day. A late substitution for Mali slows momentum - three minutes of injury time. Mohamed Yattara has run tirelessly for Guinea up front and he is hacked down - a clever foul to kill play - prompting Seydouba Soumah to hit a free kick from range. He finds he wall and we are three minutes from lots being drawn to split these teams. Vincent Aboubakar takes a few steps back, runs up and....... bang. The ball fis blocked though. Bakary Sako is a big lad, broad shoulders, hardly the lean, tricky winger type, but that's what he's playing like. He teases and taunts his marker, weaves a yard, slips one across goal...own goal...no. The defender breathes a sigh as the ball goes wide. Five minutes for Cameroon to save themselves. A goal and its drawing lots all around. As it stands, Ivory Coast are through as group winners. The big build-up. A wall is constructed (it would have been quicker to build a brick one). Free-kick Mali...20 yards...Seydou Keita over it...bang...into the wall. The time investment in setting that barrier up was worth it. Keita has not had a day to remember. BBC Sport's Steve Crossman in Malabo: You know when you think a team will get one more chance...that may have been it for Aboubakar. Just when he needed a clean contact. Fans still doing everything they can but all the flag waving and singing looks like coming to nought here. Cameroon haven't looked nearly as threatening after Edgar Salli's replacement which I can only assume was because of an injury. I've seen some late goals in this stadium... Asamoah Gyan against Algeria to win it for Ghana. Moussa Sow winning the game for Senegal against the Black Stars with literally the last kick of the match. Less than 10 minutes here for one of these sides to grab a place in the last eight. Ivory Coast coach Herve Renard admits Yaya Toure may struggle to replicate his Manchester City performances at international level. He said: "Ivory Coast are not Manchester City. The potential of the players is not the same. "At City there are a lot of players able to defend very well and create. "With us, it is a bit different, which is why we ask him to do a different job, although he was very comfortable because he was used to doing that earlier in his career, especially at Barcelona." A real chance for Vincent Aboubakar but he scuffs his shot from eight yards and goalkeeper Sylvain Gbohouo pounces gratefully. Yaya Toure limps off for Ivory Coast and is replaced by Cheick Doukoure. Jack Vagabond: Why doesn't it go to penalties? Drawing lots is very strange way to decide. I wish I could answer that one for you Jack. Keep tweeting us on #bbcafcon. How would you feel if your team had to draw lots? Foul...foul...foul. We approach the 40th one of this match and Guinea are almost made to pay. Having just conceded a free kick in the exact same area, they do the same again and Seydou Keita's delivery causes mayhem in the six-yard box. Penalty appeals by players for handball, not given. Mali are banking on a bit of luck here and they'll need more tomorrow if it goes to the drawing of lots. Free-kick from Cameroon on the edge of the penalty area on the left..... a rare chance. Comes to nothing as the Lions struggle to create anything. Attack v defence. Red and yellow Guinea shirts camped in their own half. If they survive this 15 minutes I'd be surprised. Retention of possession is non existent for the side which led through Kevin Constant's penalty early on. Big headed chance for Molla Wague of Mali...glances it...slips wide. Unmarked. Into the last 15 minutes at Malabo and Ivory Coast appear to be in cruise control. They know though a goal from Cameroon and their progress is in danger. Yes, yes, yes, for the Sunday League enthusiasts as Molla Wague lumps a massive up and under clearance down field. The ball orbits Mars and comes back into the atmosphere...how will it bounce on this boulder of a pitch? Heavy and well mopped up by the Guinea back line. Here comes Bakary Sako of Wolves for Mali. A handful this guy. Replaces Abdoulay Diaby who played on the right flank, not a familiar berth for Sako. BBC Sport's Steve Crossman in Malabo: Cameroon boss Volker Finke has finally turned to Lyon striker Clinton N'Jie. He's been repeatedly asked in press conferences why he hasn't had a chance...that means if he scores and Cameroon go through then many of the Cameroonian journalist here will, I suspect, suggest it is in spite of their coach and not because of him. He's just had a shot deflect over and the fans in front of me are going wild and chanting his name. Salif Coulibaly of DR Congo outfit Mazembe uses his full frame and an acrobatic fling of the body to cut out a driven pass by Kevin Constant. It's a crucial interception and sparks an attack for Mali but Abdoulay Diaby goes early and is offside. He was away there. Credit to Mali. They have come out after the break, got their goal and dominated. Corners are forced with balls played between centre-back and full-back leading to dangerous attacks. Guinea have brought Seydouba Soumah and he at least looks fresh legged up front but their attacks are sparse. Almost game over as Wilfried Bony bursts through on goal for Ivory Coast. It looks as though he is being pulled back by Nicolas N'Koulou but, with play waved on, his shot is straight at goalkeeper Fabrice Ondoa. Danny Newfb Robson: Belguim have a great team on paper. Never do anything though. Wing Lam: England 2004, 2006 and 2008 were not managed well and severely under achieved! Dean Mcmillan: Why are people saying England? A team with bang average players. Not a world class player among them. Technically not even close to many other countries. What do people expect England to achieve? BBC Sport's Matthew Kenyon in Mongomo: The Mali fans are jumping now. They can see more goals for their side here this evening, and with Maiga rampant down the left, and defending like Guinea have displayed so far in this second half, who can tell them they're wrong? The last time Ivory Coast failed to get out of the Africa Cup of Nations group stage was in 2002, having finished runners-up twice and third since then. They did lift the trophy back in 1992 in Senegal and are highly fancied to challenge for the title this time round. That is if they get out of the group stages. They are on track as things stand. Issiaga Sylla - the Guinea left back - trots off and Djibril Tamsir Paye comes on. He has just one cap before today so his belly is probably jumping a bit now. Not much margin to knock off the rough edges here. Guinea look to have gone into themselves a little. Territorially this is all in their half. Cameroon are looking a little bit more lively here. They know if they find the net, they are back in this tournament. Now then. How's your bottle? Stick and take a lottery draw of play your way to progression while taking the odd risk? Managers Henryk Kasperczak and Michel Dussuyer, this is where you earn your corn. A tight five minutes has followed that leveller, Mali shading it and excellent work by Maiga sets Mamoutou N'Diaye to shoot...good low save. 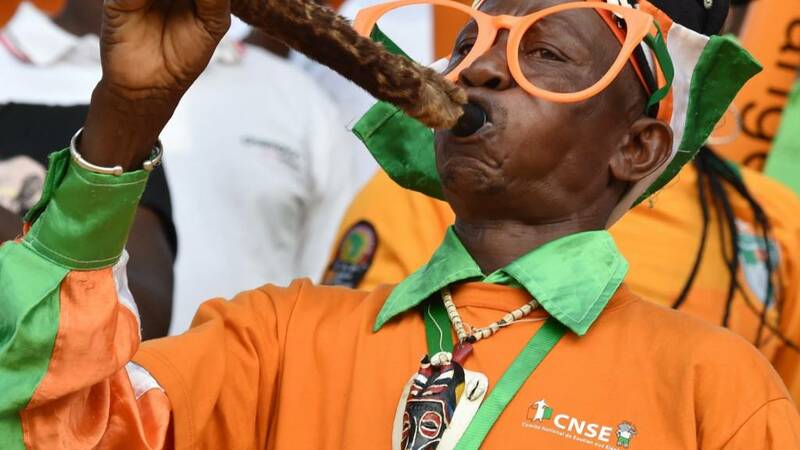 So, it is Ivory Coast topping Group D with Mali and Guinea joint second. They will be drawing lots tomorrow to see who goes through if results stay as they are. A Cameroon equaliser against the Ivorians and all four will be drawing lots.... Drama. The West Ham man, on loan at Metz, Modibo Maiga has been Mali's most vibrant player and he cannot miss at the back post to level this up. Abdoulay Diaby's cross does all the work for him, taking the nearest defender out of the game and the header is powered in. Cameroon have won the Africa Cup of Nations four times but surprisingly failed to qualify for the tournament in both 2012 and 2013. Before that, they reached the quarter-finals at least in the previous seven Afcons. Time for the Indomitable Lions to step up to the plate? Changes for Cameroon with striker Vincent Aboubakar replacing Edgar Salli. He can be a danger. Both games are underway at the exact same moment. A gent on the phone near the halfway line gives the referee a signal. I wouldn't fancy his bill as Cameroon and Ivory Coast keep us waiting. A massive 45 minutes ahead. There were indeed 26 fouls in that opening 45 minutes and not one yellow card. The top mark of 48 fouls at Afcon 2015 (Tunisia v Cape Verde) is in sight. Ivory Coast have been criticised by a former player for failing to reach the heights their talented generation looked set to accomplish. We asked you, what player or team do you think has failed to deliver when they had the talent to do so? E.Anderson: I was born in Sep 82 n since then Ghana Black Stars have always had so much promise but yet to win a single trophy in my lifetime! Raymond RT3 Tolulope: Teranga Lions of Senegal 2002-2006. Apart from reaching the quarterfinal at 2002 World Cup, they declined and failed to deliver. Surprisingly Cameroon have had more of the ball but it is Ivory Coast looking the far more dangerous. BBC Sport's Matthew Kenyon is watching Guinea v Mali in Mongomo: Hard work for these guys just keeping mentally on top of this game - at least in the first 20 minutes. Those back to back penalties were bracketed by some breathless play in which Mali had the better opportunities. But Guinea scored from the spot, and Seydou Keita's penalty was saved. Can they hold on? I think we'll see more goals here tonight. Maybe we should have a 1-1 draw! A tale of two penalties. Kevin Constant netted (beautifully with a chip down the middle), Seydou Keita had the chance to level moments later but fluffed his lines badly from the spot. Guinea...the quarter-finals are getting closer. We are approaching 25 fouls in this first half. The record for the tournament stands at 48. On course. No bookings yet. Work that out. Ibrahima Traore is miniscule and creeps into space to collect a ball from the Guinea left. It's a good area, shooting chance, but dribbles to the Mali stopper. Ibrahima Conte in the Mali midfield nails someone from behind. No booking. Not sure what you need to do to be booked. The ball bobbles and bobbles on this pitch. So much so that a Guinea attack ends with the ball back with their keeper as they opt for percentage passes rather than anything awkward. How crucial then was that penalty exchange as this pitch will help the defending team you'd think. Guinea bettering it with 57% of the ball so far. BBC Sport's Steve Crossman in Malabo: Fabrice Ondoa cutting a lonely figure after that goal. A great strike yes but he has to save that. Gbohouo shows him how it's done down the other end. You would think a man of this experience will have one or two wise words fro Mali at half time. Kasperczak has taken charge of the likes of Lille, Tunisia, Ivory Coast, St Etienne, Morocco, Montpellier...the list runs and runs. BBC Sport's Matt Kenyon in Mongomo: We've settled down a bit here, after that breathless start. Mali's supporters aren't downhearted just yet... the band is in full effect, the drums are going and the flags are waving on a cooler evening here in Mongomo, the last time we'll be here at this Nations Cup, now they've moved the quarter-final from here to Malabo. Kevin Constant is buzzing after his early goal and pings a delightful arrowed ball across field. His efforts see Naby Keïta hacked down by Mali's Adama Tamboura who gets his second warning of the game. He has done well to escape a yellow. Ex-West Ham man Modibo Maiga has a bang for Mali...cracker...tipped over. What a strike from the former Leeds United man. Max Gradel picks the ball up on the edge of the penalty area and smashes it home from 20 yards. Ivory Coast now heading through with Guinea. So with an hour of Afcon 2015 group action left, we have two sides on course to draw lots. Guinea's lead would put them through but the stalemate between Ivory Coast and Cameroon would see the pair need to draw lots tomorrow. The pitch here in Mongomo is posing problems for players. Like all the surfaces in this tournament it has not been in place for long and the roll of the ball is often interrupted by bobbles. Mali are currently getting frustrated with it as attacks break down with each heavy touch. Penalty-save hero Naby Yattara tries to clear a back pass first time in the Guinea goal and rolls it across the floor inches beyond the stretch of a Mali striker, What was he thinking? Blame the pitch fella. Guinea is one of the worst impacted countries in the recent Ebola epidemic in west Africa. Only Liberia and Sierra Leone have seen more deaths and the stigma carried by the virus was felt by the national team's players. Borussia Monchengladbach winger Ibrahima Traore says players were tested for Ebola in the dressing room, just before a vital match against Togo. "We felt disrespected in other countries; to us it was like some people were seeing us Guineans not as human beings but as a disease," Traore told BBC Sport. Jeremiah Kariuki: What a game! Guinea get a penalty. Scores. On restart, a penalty for Mali. But Keita wastes it! A cracker this game is. E. Anderson: m eager to see drawing of lots. Praying for one win one draw in the 2 games! Will be another interesting twist to this Afcon! Tweet us throughout this dramatic Group D finale on #bbcafcon2015. As we stand, Cameroon and Ivory Coast will be drawing lots to decide who goes through as runners-up behind group winners Guinea. This will now take place in a hotel tomorrow, rather than in the post match news conference. Could be a long night for some players if that happens. What a start to this game. Two penalties, one in, one out, some decent chances and a referee who will now be scrutinised. Defensively Guinea look ragged, so there is a long way to go before any of their fans can relax. BBC Sport's Matthew Kenyon in Mongomo: This game is being played at such intensity. The referee's decisions have intensified that - and the challenges are flying in. Guinea coach Michel Dussuyer indicates to his squad to calm down. Thanks to Naby Yattara in goal they're in front. And that takes them through. A long way to go though. Less drama in Malabo but Max Gradel's downward header for the Ivory Coast is well turned away by Cameroon goalkeeper Fabrice Ondoa. Seydou Keita has won silverware in two countries and formed part of Barcelona's dominant side under Pep Guardiola between 2008 and 2011. The 35-year-old midfielder has an impressive haul for his work. Three La Liga titles, two Champions League winner medals, two Copa del Reys and a French cup success with Lorient in 2002. If Mali get to the final, he will likely earn his 100th cap on the day. The most experienced player on the pitch takes an abysmal penalty. Left footed, he goes tamely to the goalkeeper's right and a good guess by Naby Yattara allows him to save and hold the ball. When a keeper holds a penalty you surely know you've had a shocker. Referee levelled it up? Too easy a call to make? Certainly I don't think either set of fans would complain for too long if neither of these penalties had been given. Modibo Maiga does well in the right channel to weave inside and he smashes a shot which pole axes a Guinea defender. Baissama Sankoh is out on the deck but the referee adjudges he stopped the ball illegally. It was like a missile and that seems harsh. The Guinea midfielder Kevin Constant makes no mistake from the spot. Guinea are going through as things stand. Ibrahima Traore of Guinea lashes a shot and Salif Coulibaly bravely puts his head on it but can only deflect the ball onto his hand. He would have known little about it but ultimately it was his own header which fizzed onto his own hand. Ivory Coast goalkeeper Sylvain Gbohouo is penalised for handball outside the penalty area. He is right to be furious as he had let go of the ball before he left the box. Still, chance for Cameroon... but Franck Etoundi heads over. A big call and Mali want a spot kick. Should they have one? Probably. A route one ball catches Guinea's vulnerable looking defence at sixes and sevens and as Mustapha Yatabare sizes up a great chance from a central position, he is sneakily nudged in the back and clatters into the goalkeeper. IT was a push, of that there is no doubt. Fode Camara the offender is a lucky boy. The Guinea goalkeeper must be sharp. Naby Yattara has 16 outings in six years for Arles-Avignon in France. I do hope he works hard in training or that is one easy life. Huge pressure on the Ivory Coast this evening. They have often been labelled the 'lost generation' and this could be their last chance to achieve something. Abdoulay Diaby thought he was getting Mali off to a dream start there as a game of pinball in the box ends when the ball lands at his feet. No punches pulled, he swings at it but the ball is deflected wide on the edge of the six-yard box. Chaos in the area and Mali force a number of corners, they will be encouraged. Ivory Coast start on the front foot as Wilfried Bony almost prods the ball home from close range but Cameroon goalkeeper Fabrice Ondoa scrambles the ball wide. Guinea have one of the most striking kits I can remember in a long time. It's the type of number you would willingly save up for as a kid because not many of your mates would be seen wearing it. A glossy red shirt, bright yellow shorts and green socks. Like some sort of sweet you'd see in a 10p mix. Mohamed Yattara of Guinea leads the line for his side and as a striker, commits the disgraceful act of wearing a defender's number on his shirt - 2. That should not be allowed. He neatly pulls the ball down in a good area and dances around but cannot produce a delivery. Mali want to lay down a marker at the other end and Abdoulay Diaby blasts powerfully over from range. BBC Sport's Matthew Kenyon in Mongomo: Huge noise here in Mongomo. Mali have got a big following - about a third of the stadium I reckon. But Guinea's few hundred fans making themselves heard too. Great atmosphere for this decisive game. BBC Sport's Steve Crossman in Malabo: Almost everyone inside the Estadio De Malabo is on the edge of their seats, this game should be something special. Except this guy...he's less excited. They are underway in both games. Group D could not be tighter - drama is ahead. A sportsman's handshake in Mongomo as captain of Mali Seydou Keita meets Ibrahima Traore in the centre circle. Guinea will wear red today, Mali in all white and they huddle before kick off. Are all neutral fans willing the drawing of lots? Interact with us throughout on #bbcafcon2015. Anthem time in Malabo. Not too many of the Cameroon players putting too much gusto into their rendition but the supporters are more than making up for them. Even worse from the Ivory Coast players - with the exception of Kolo Toure. Well done sir. BBC Sport's John Bennett: Drawing lots at Major tournaments: 1/ 1954 determine if Turkey/Spain go to World Cup. 2/ 1990 decide if Ireland/Holland finish 2nd in group. Ivory Coast should be motivated to avoid any drawing of lots when they play in Malabo today. The last time a draw was needed to decide qualification in the tournament came in 1988. The Elephants and Algeria had identical records after three group games and it was Ivory Coast who were dumped out of the tournament as probability worked against them. BBC Sport's Steve Crossman in Malabo: It is wonderfully loud here in Malabo as a big section of Cameroon fans joust with their Ivorian counterparts on the far side of the stadium. "Indomitable" chant the Cameroon fans - their nickname is the Indomitable Lions - and the orange clad Ivorians respond with some eye catching dancing. It's not full by any means but those that are here are making a right racket. Mali won the bronze medal at the last two Nations Cups despite being given little chance of making the knockout phase. They arrived at the tournament in indifferent form, with three 2-0 wins in qualifying and three defeats. Progress could be wrapped up by now but the Eagles squandered leads to draw both their group games so far. Cameroon XI: Ondoa; Guihoata, Nkoulou, Chedjou, Bedimo; Mandjeck, Mbia, Salli, Moukandjo, Choupo-Moting, Etoundi. Ivory Coast XI: Gbohouo, Kolo Toure, Bailly, Kanon, Aurier, Yaya Toure, Die, Gradel, Tiene, Bony, Doumbia. BBC Sport's Steve Crossman in Malabo: Cameroon boss Volker Finke has given Franck Etoundi his first competitive start tonight. He is Stephane Mbia's brother and will be one of Africa's best players in two years time according to the Cameroon captain. It's about time he got a chance but Cameroonian journalists won't like it, he's been berated for selecting new players without much experience here in Equatorial Guinea. Not the toughest question he's had to deal with though, pretty sure that was "Finke everybody hates you are you going to quit?" BBC Sport's Matthew Kenyon ‏in Malabo: There are a lot of #Mali fans here today. They've been in for a couple of hours. #Guinea here too. So a former Afcon winner - Abdoulaye Traore - says Ivory Coast have missed out in their golden generation. Can you think of any other teams or sportsmen who did not deliver when it looked like they had all the tools to do so? Tweet us on #bbcafcon2015 or post on BBC Sport Facebook. Abdoulaye Traore, who won the African Cup of Nations with Ivory Coast in 1992, believes the current crop of players will have missed an opportunity if they don't lift another title. He told the BBC: "My heart bleeds when I see that this team, full of talent, has not yet won a trophy. Individually they are good players but football is a collective sport; you are all together, if you do not love each other, if one of you has something in his heart like frustration there can never, never be a good result. "For me it is a lost generation, they have not yet brought one trophy home. Any coach in the world - even Jose Mourinho - would dream of coaching a team like this. Unfortunately we do not have a team, we have individuals." An Ivory Coast exit may today may well draw smiles at the desks of one or two Premier League managers. The Elephants have the greatest number of England-based players among their party and exit would see Yaya Toure and Wilfried Bony return to Manchester City, Kolo Toure make his way back to Liverpool and Cheick Tiote catch a flight back to Newcastle. Kenny Jackett at Wolves also has an interest. His striker Bakary Sako will lead the line for Mali. So far, Mali, Guinea, Ivory Coast and Cameroon have all shared 1-1 draws in the four matches played in this group. They therefore have the same head-to-head, goal difference and goal scored records. If there is a winner in one fixture but a draw in the other, the victorious team is through but the two teams to draw will be deadlocked and again separated by drawing lots. So why have we started this live text like some sort of National Lottery presenter? Because Group D brings together four teams who have so far all played out 1-1 draws, the likelihood of qualification being decided by the drawing of lots has increased. Welcome to the African Lottery of Nations. Yes, you read that correctly. Today we have a little bit of football on hand and then could quite possibly turn our attention to a raffle/ lottery/ prize draw/ call it what you will.